You must make reservations at least 5 minutes in advance of the time at Nordstrom Grill - Downtown Seattle. We have valet parking, several parking garages close by and metered street parking. Metro and Sound Transit bus service with stops at Westlake Center. Monorail access too and from Seattle Center. 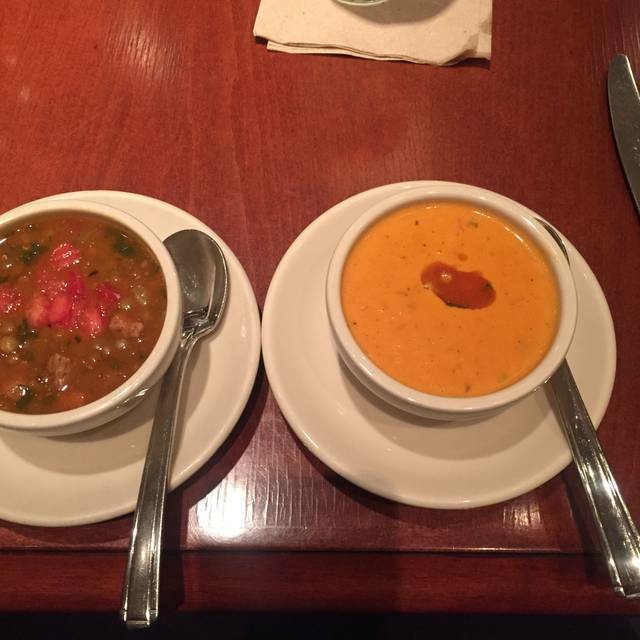 Featuring memorable soups, salads, grill dishes and desserts, our comfortable and classic full-service restaurant is set in an environment of historic community photographs. Full bar service is available. The Nordstrom Grill is located in the heart of Downtown Seattle just a few blocks east of the Historic Pike Place Market on 5th & Pine. The Grill can be found on metro level of the Flagship Nordstrom. Tucked just behind the men’s suit department the Grill offers a variety of American classic comfort food with a modern Pacific Northwest twist. Lacinato kale, organic baby spinach, asparagus, yellow squash, zucchini, corn, tomatoes, avocado, crispy farro, parmesan cheese, micro basil, creamy garlic vinaigrette. Baby gem lettuce, garlic croutons, parmesan cheese crisp, white anchovy, Caesar dressing. We are featuring a Wild Sockeye Salmon Burger with pickled vegetables, szechuan glaze and gochujang aioli this month - perfect for lunchtime! If you are looking for a little more, we have Northwest Lamb T-Bone Chops with charred shallot fingerling mash, grilled asparagus, and oven roasted tomato vinaigrette. Save room to finish your meal with our homemade Strawberry Rhubarb Clafoutis. Ask your server for details. Our waiter was excellent. We asked to have out lunches split for sharing and he complied with no problem. Wonderful food. The noise level was not "energetic" as I was allowed to register in the previous section. It was like trying to talk in a bowling alley. Despite very fine service, decent food and prices, I will not be subject my ears to such a din. No, not "energetic." Wonderful experience. Quality Nordstrom all the way. Meet your daughter or a friend for an exceptional lunch and quiet time away from the hustle and bustle of crazy downtown. Lower level downtown Nordstrom store. Definitely will be back. Great and fast service; nice ambiance. Will definitely return. Super happy with the way they split our salad and entree and plated it so nice. Took awhile to get someone to come to our table, even with water. I felt like they seated us in the bar because there were just two of us, even though we made reservations. It was one of the bartenders that served us. The service was outstanding. Our waitress took care of us so well and was such a pleasant person! I asked for my caesar salad to be lightly dressed, and it was overdressed. Also, some of the romaine leaves were brown, and the "croutons" were just tiny little crumbles. It was not a good salad. Hidden gem...top five burger ever. Great martini! Excellent food but terrible experience with hostess Emily at time of seating. Very rude and not customer service oriented. Will not return most likely. Good downtown worker/shopper lunch location. Can be rather noisy, hard to hear. Nice booth sizes, food is good and service is good. You can get in and out in under an hour to get back to work. Great service. French dip is always my favorite. food was super good. I went for lunch, and then i came back for Happy Hour! Always Fantastic service and food ! Phil is the best ! It just wasn’t worth it. Our waiter never came back to check on us. My daughters food was cold. It was disappointed considering we spent $80 on three meals and one was a kids meal. We were heading to the paramount for Lion King and we were almost late because our server was so slow or overwhelmed, one of the two. Disappointed to say the least. I've been going to this restaurant for years and have always had a great lunch with wonderful service! Down rated ambience due to tables so close together and uncomfortable chairs. When I worked downtown I used to eat at the Grill at least a couple times a week. I've been retired for three years and came back for the first time in a while to have lunch with my wife and her father. The portions are smaller, the prices are higher and the menu has changed and not necessarily for the better. I had the crispy chicken sandwich and it was dry and over cooked. My father in law had the salmon salad and the piece of salmon was so small it was barely noticeable on top of the greens. It's still an OK place but it's not the same. Good for lunch. Not great. Food was great but we were seated 30 minutes after our reservation and then waited for our food for over 45 minutes. Very helpful servers! We were 1/2 hour late for our reservation and didn't have long to eat before going to a show. They were able to serve us very efficiently and guide our choices to things that could be ready quickly. Quick but not rushed, perfect. Great! Fun atmosphere for the holidays! Great for the basics: Salad, Soups, Sandwiches. VERY delighted that they refill an arnold palmer. Their waitstaff is always good. Delicious food. I had the spinach salad with grilled salmon and my wife had the salad with shrimp and lime. Her cocktail was also excellent. Great service, too. Food arrived very quickly. 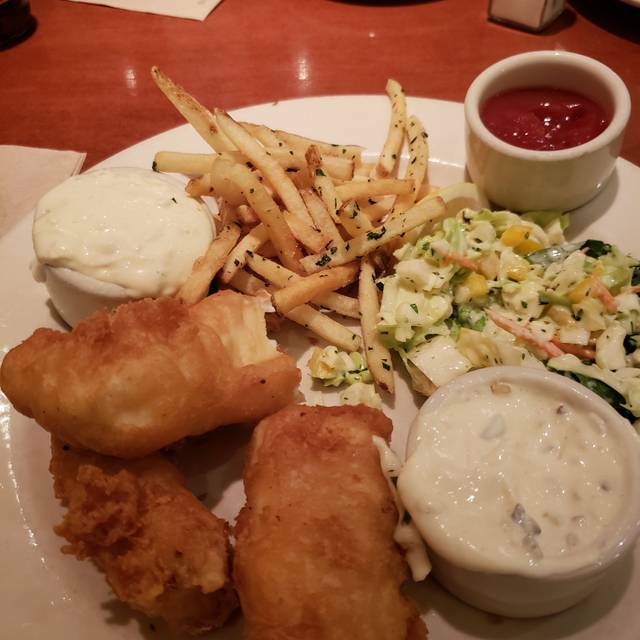 While I have several times ordered the fish and chips, this time the side of coleslaw had so much horseradish sauce as to be seriously overpowering. The seating lady was very nice. We had a good laugh with her. Food was soooo tasty. Phil is a superstar Server and food is always excellent ! The grill is underrated. We love eating here. The food is creative and delicious. And the "figgy" cocktail was wonderful and innovative. It is our go to place. Great service and food was excellent. It was quiet enough to talk. Thanks for everything. Risotto was to die for! Great experience. For a flagship location, it was a disappointment. Average, with a cafeteria feel to it. Good service, but overall something was missing. 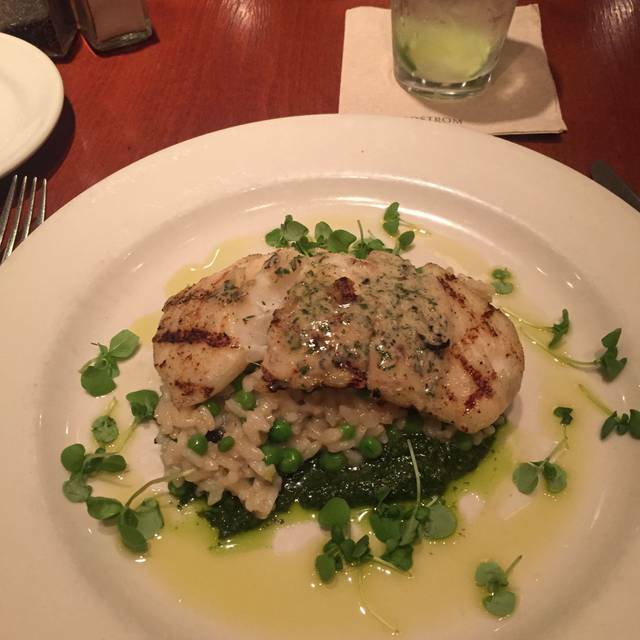 Nordstrom Grill never disappoints. The service was great and the food was simple and delicious. They use quality ingredients and don't overcomplicate things in the preparation. Our waitress was very thoughtful and made sure we had everything we wanted at all times. Natalie your hostess is so accommodating & lovely! I go there on a regular basis and find the food to be consistently good and although the place gets very hectic (and noisy) a lunch the service is generally good. rsvp was at 1pm and it wasn't busy, less than half of the restaurant was full but the food took a very long time to get done. Server took down the wrong order for one of the 3 orders so that took a lot longer. My fish riosotto was very salty, the risotto was. The food was good. Our server could gave been friendlier.